Box Contents: 1 C736H1KG Black, 1 C736H1CG Cyan, 1 C736H1MG Magenta, 1 C736H1YG Yellow Premium replacement toner cartridges. Satisfaction Guaranteed. 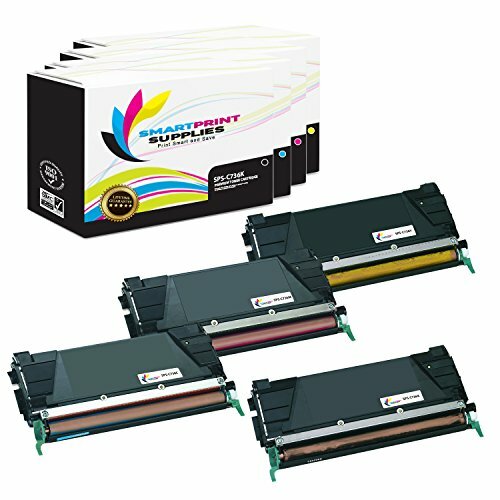 Smart Print Supplies premium C736 cartridges are designed and manufactured using high quality components and state-of-the-art toner technologies that only US-Made products can offer. Using state-of-the-art toner technologies, Smart Print Supplies C736 toner cartridges deliver consistent and reliable text, page yields and graphics with accurate color reproduction. Smart Print Supplies C736 for Lexmark printer cartridges can withstand both high volume print jobs and recurrent office or home laser printing. Smart Print Supplies offers high quality printer cartridge products at competitive prices. Our compatible C736 toner cartridges are perfect for budget conscious shoppers who expect only high-quality prints from their printing supplies.